David Whelan, the founder of JJB Sports, has sold his 29% holding in the sporting goods firm for £190m. 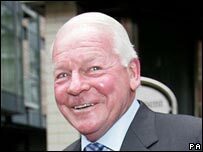 Mr Whelan, who still owns Wigan Athletic football club, sold 68.99 million shares at 275 pence each. Icelandic financial group Exista and Chris Ronnie, a sports retailer who has previously worked at Umbro and Sports Direct, bought Mr Whelan's stake. Mr Whelan, 70, is a former footballer with clubs including Blackburn Rovers, and he set up JJB in 1971. Mr Whelan has been made an honorary life president of JJB. "Retiring from the board and selling my stake in the business I founded has not been an easy decision but it has been made easier by my confidence in the senior management team," Mr Whelan said. Mr Ronnie will become JJB's deputy chief executive, and focus on sourcing and product development. JJB Sports has about 430 shops in the UK.